The markets ended an impressive year with a whimper. All major indexes finished the holiday shortened week down more than 1% on low volume. The Dow Jones Industrial Average lost 1.2%, the S&P 500 dipped 1.5%, and the NASDAQ Composite fell 1.7%. While the equity markets limped through the finish line, the U.S. Dollar sprinted. The WSJ Dollar index rallied 12% in 2014 and gained another 0.8% on the first day of 2015 as investors bet the U.S. economic recovery continues. This compares to more easing expected for Europe and Japan. This divergence in central bank policy is a key item to watch in 2015. Last week, Chinese smartphone maker, Xiaomi, officially became the world’s priciest startup with a round of funding that valued the company at $46 billion. Only Facebook fetched a higher valuation when it raised money from private investors in 2011. Last year witnessed a renaissance in Silicon Valley. Nearly 70 startups are now worth more than a billion dollars. Adjusted for inflation, this is twice as many as during the original tech bubble in 1999 and 2000. Private tech companies are benefiting from a giant pool of money flooding into Silicon Valley as institutional investors search for returns amid near-zero interest rates. According to Venture Source, venture capital firms raised more than $32 billion in 2014, up 60% over the prior year. The bubble in private firms could have ramifications for everyday investors as well. Traditionally, startups were exclusively funded by venture capital firms, but 2014 saw an increasing number of mutual funds join the party by making private investments in many technology companies. 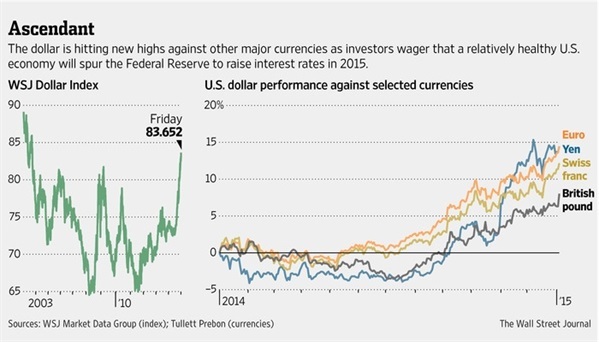 Some companies in emerging markets could face an increasing difficult time in 2015 as the dollar continues to rise. This appreciation in the greenback is squeezing companies in emerging markets that now face roughly $1 trillion of dollar-denominated debt issued over the past couple of years. 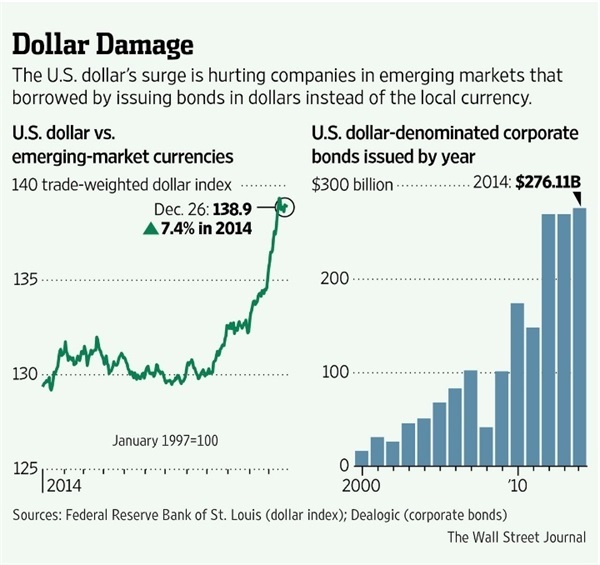 In 2014 alone, emerging market companies issued a record-high $276 billion of dollar-denominated debt. Some could even face a double whammy where falling commodity prices lower the income available to repay debt while the rising dollar increases the cost of that debt. This mounting pressure is reminiscent of currency crises in Latin America and Asia in the late 1980's and 1990's, respectively. Despite these potential potholes, investors have yet to take notice. Retail investors across the globe have poured more than $180 billion into emerging market debt funds over the past four years, and few have begun pulling money out despite some shots across the bow. In recent weeks, emerging market debt funds in the U.S. and Europe have experienced just $3 billion of outflows. Have you ever wondered why making spaghetti can be so messy? Bending a handful of dried pasta to break it before dropping it into a pot of boiling water almost never ends up with just two halves. 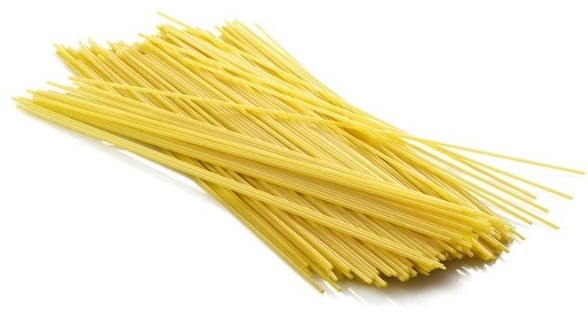 Almost always, the strands of spaghetti will break into three or more pieces. This sounds like a mundane and silly party trick, but the science behind the phenomenon has stumped some of the greatest minds in the country for decades. Even Richard Feynman, a member of the team that developed the atomic bomb and often considered one of the world’s greatest physicists, couldn’t solve the puzzle. The riddle wasn’t cracked until scientists could perform this experiment with cameras that film at 250,000 frames per second. It turns out that the flexibility of pasta explains why. When you apply force to a piece of spaghetti, it bends until it breaks. Once it snaps, it is free from the force that caused it to bend and it begins to straighten out. However, the tension caused by bending is released more slowly at the ends of the pasta, and within a matter of milliseconds, the straightening end meets the still curved piece and causes a second fracture. Next time you’re making spaghetti, challenge your dinner companions to grab a strand of pasta by the ends and snap it in just two pieces. Tell them if they can’t, they are in charge of washing dishes. Securities offered through Jacques Financial, LLC (JFLLC) Member FINRA and SIPC. Certain associates of Joseph W. Jacques, CPA, CFPTM are registered representatives of JFLLC. Joseph W. Jacques, CPA, CFPTM and JFLLC are affiliated. Investment advisory services are offered through Jacques Advisors, LLC an affiliate of JFLLC. Tax services are offered through Jacques & Associates Certified Public Accountants, LLC an affiliate of JFLLC. *The Russell 2000 Index measures the performance of the small-cap segment of the U.S. equity universe. The Russell 2000 Index is a subset of the Russell 3000® Index representing approximately 10% of the total market capitalization of that index. It includes approximately 2000 of the smallest securities based on a combination of their market cap and current index membership. The Russell 2000 is constructed to provide a comprehensive and unbiased small-cap barometer and is completely reconstituted annually to ensure larger stocks do not distort the performance and characteristics of the true small-cap opportunity set. *International and emerging market investing involves special risks such as currency fluctuations and political instability and may not be suitable for all investors.